Rival groups associated with the so-called Yellow Vest movement were involved in what appears to be a street brawl Saturday during the 13th week of protests against French President Emmanuel Macron. More than 50,000 people associated with the anti-Macron movement marched across France, according to police reports. 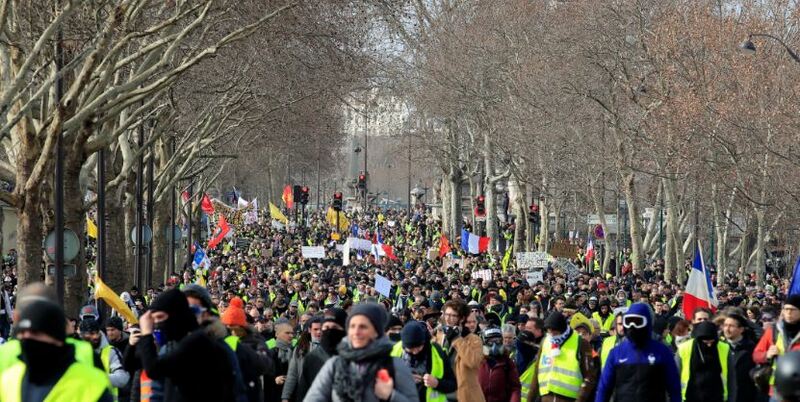 The number of protesters has ebbed considerably since the first Yellow Vest demonstrations in mid-November 2018. Far-right yellow vests and far-left yellow vests fight one another. “We’re not children, we’re adults,” Hugues Salone, one of the throngs of activists, said while marching Saturday, Reuters reported. “We really want to assert our choices, and not the choices of the politicians who do not live up to them.” Some witnesses claimed violence ticked up during the melee. One young man who was trying to take pictures of the demonstration was injured on his left hand after riot officers fired tear gas into the crowd. Witnesses said he lost four fingers after trying to knock away a concussion grenade. Demonstrators shouted “Macron resign!” suggesting that the French president’s troubles were not over, despite Macron’s decision to ding a gas tax in December that kickstarted the protests. He had previously his ground, seemingly unwilling to give into protesters’ demands. Lawmakers from Macron’s party have received threats in recent months. Activists targeted Britanny home of Richard Ferrand, the president of the National Assembly and a close Macron ally. “Nothing justifies intimidations and violence toward an elected official of the Republic,” the French president wrote on Twitter following the protests.